How to Cut Sugar Cravings Without Losing Your Mind! Ever tried to lose weight by doing something like cutting sugar out of your diet? How did that go? Chances are you probably quit very quickly because without that rush and satisfaction of eating something sweet, you felt like you would lose your mind! Nevertheless, if you want to reduce the health risks associated with eating too much sugar and also lose weight, there’s no “cutting” out the facts: You need to lessen your intake of it or stop eating it completely, but that’s something that I think is too radical to do, the options I’ll show you are a lot easier. This is something I personally decided to do when I felt that each day I was eating too much of it. Honestly though, my biggest intake of it involved me putting it in my tea very often. 1 of the cups I would use to drink the tea from would be about 3/4 of a liter and I would drink multiple cups everyday with each having around 3-4 teaspoons of sugar. Because I was much younger at the time, it was much easier to ignore this health problem but as I entered my mid and now late 20’s, and the stubborn belly fat started to pile on, as well as the reality that if I didn’t change things, I would be at a greater risk for health problems, I have tried various different ways to cut it out and have found a 5 methods that even the most addicted people can use to lessen it. 5 ways to cut out the sugar/carbs! Do you know the difference between carbs and sugar? It’s easy, all that sugar is, is the most simple version of a carb. Everything we eat that has carbs, breaks down and then gets turned into glucose for energy so it’s the same thing, just one is a more complex version of the other. 1) Switch any refined white sugar with the organic brown version. It’s not a permanent way to fix the problem, you are basically shifting the addiction from something that’s bad for you to something that’s a little bit less bad, but it is a transition you can start to make and then get into the more truly helpful tips moving forward. Generally this “substitute” doesn’t taste that much different than the most basic white version so you won’t have problems transitioning your taste to it. This is something I used to do when drinking tea. When it came to buying ingredients and other foods, I would try to buy more organic based carbs. 2) Raw honey (not the regular one) makes for an even better substitute. At least for most things you’d normally use sugar for (tea, cakes, oatmeal) anywhere where you would put it, now just substitute it with raw honey. Stevia is a natural herb that basically replaces sugar without harming you. It is basically a safe way to add things to your food and drinks without risking the extra dosage of the regular stuff. While it doesn’t taste the same (it basically tastes like vanilla), it’s something you can experiment eating and drinking with for at least a week while feeling pretty satisfied as though you’re still eating something sweet. It takes time to get used to Stevia, but it’s a great product. 4) Eat less things with complex carbs by just lessening your intake of it daily and weekly. Also, by doing this, not just when I drink but also when I eat, I have noticed that at first the cravings will hit when you first lower the intake in that my brain will start to make me think it needs me to eat more of something sweet and since I only rely on drinking from that smaller cup, I found that just by waiting about 10-15 minutes after finishing the cup, that usually the craving go away after that. If I can’t take the stress, I just force myself to drink an extra cup of regular water to make up for that craving my brain is trying to make me satisfy. When my body is full of water and food, and a little bit of time goes by, it doesn’t crave anything anymore and I am satisfied that I didn’t give into it. These cravings hit me only when I’m hungry/thirsty and once I fill myself up with something other than carb related foods/drinks and start to feel full, the craving cease. In addition this tip has helped me consume overall less carbs in general and more healthy proteins because I know it’ll only take a little bit of time before I stop craving the bad carbs. In the worst cases, I’ll eat a fruit. Any consumption of carbs is much better prior to something like a physical workout. It helps your use what would be the extra glucose going into your body instead for energy so that won’t be added into your body and then become fat. I have found that prior to any workout, eating something with some carbs and mainly protein is the perfect mix for me to get through a difficult physical experience while maintaining my energy for a long time. Have you ever eaten something with a lot of carbs such as cereal, but felt full for only a short period? Well that’s how it works with carbs, so if you do eat a lot of them, make sure to use the energy rush you get from it for something physical right away. So don’t eat or drink something with a lot of sugar/carb and then do something inactive right after like go to bed or sit in a chair for hours without doing any physical activity. For cases when you work, something like chocolate or again the stevia option would make for great substitutes, but in small amounts, just enough to give you the energy to finish the work and leave. Try to balance out the intake with the calories you need to burn to finish a job. A warning: You will want to abuse these tips. I’ve personally seen that once I’ve started doing these 5 things, that I actually wanted to increase the amount of the other, less harmful products I’ve taken because I let the addiction kick in and I also though that I was doing it in a safe way so I would have no problems eating more raw honey or stevia or the other tips. But be careful not to let yourself get this far. Regulate how much you’re eating, get into a flow that you’re comfortable with, but know that like gambling, letting your sugar cravings get out of control is easy. So always monitor yourself and maintain a system so you don’t overdo the intake. This is a something you have to personally discipline and get into a rhythm with. The hardest thing for me to do personally was stop eating it completely and it’s like that for most people. And I still find myself drinking from the larger cup every now and then, especially when I get home and am too exhausted to think about the intake or wonder about what to cook. If you completely stop eating it and force yourself not to consume it, there are those who say that it takes a few weeks before your addictions to it will stop and you’ll start enjoying foods that don’t have much carbs, but to reach that point is something most people will never be able to do. I salute anyone who has the will power to maintain that mental fortitude needed to not eat carbs for a long time, but I personally think there should be a slow change unless you have health risks that require radical changes. If you substitute your sugars/carbs with things that are less harmful and even healthy (fruits/raw honey) while also timing that you eat them such that you burn them away through exercise, you may start to see weight slipping away! One thing that I noticed from my own experience is, that I usually eat sweets whenever I am hungry and should be eating a proper meal or even more, I am not even hungry but I am actually thirsty. So the next time, try to drink a glass full of water and see if your craving for sugar goes down. Thanks for the article! Thanks for the great post! I have lost a lot of weight and I think it is because I eat a lot less carbs. However it was not intentional, it is a side effect of something a nutritionist told me – I had stomach trouble for a while and she told me that our stomachs find it difficult to digest proteins and carbs at the same time. Therefore I now never mix by carbs and proteins, having each at different meals with veg and some fat content. As a side effect, whereas I used to have carbs at every meal I now only have it half the meals and I have lost so much weight and I feel amazing!!! I have also cut out sugar almost completely from my diet and now use date honey instead. I personally have a huge sweet tooth and such a serious craving for sugar, so thank you for suggesting alternative ways at which to decrease my intake! 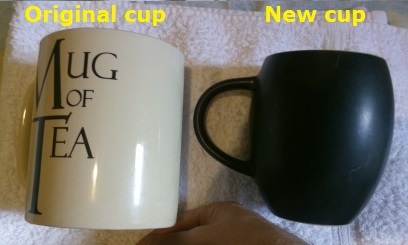 I never thought to decrease the size of my mug (which is also on the huge side) to decrease my sugar intake every time I have a cup of coffee. Those simple sugar hacks are really practical, and hopefully effective! Everytime you ask advice regarding weight loss ultimately we are told to cut out carbs, but there are plenty of ways like you say to cut down on them as apposed to cutting them out altogether. For example I have 80% cocoa dark chocolate now instead of white.Also I love tea but only have one cup a day now and I do believe this keeps your weight down. Enjoyable read.